Steep had us sold when the words ‘extreme sports’ and ‘open world’ were used in the same sentence. 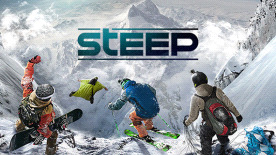 In the game, players are free to explore the massive online open world by skiing, wingsuit flying, snowboarding, or paragliding. These 4 main modes of transportation can be switched on the fly using the games menu, giving the player the freedom to explore the alps. There is also an abundance of hidden races, challenges and secret areas, which players can discover and unlock through exploring the world. The game also features a trick system for skiing and snowboarding which is a fantastic way for players to challenge their friends online. Steep sounds like a great game, like an awesome mix of SSX and Burnout Paradise! We cannot wait to take to the slopes. Please note that English is not available as a language if purchasing from the RUCIS regions or China.